LIMITED TIME: 30% OFF CLASS TUITION!! Turn a Beautiful Exotic Wood Pen Set! Sun May 19, 11a-2p NEW! Tue Jun 16, 630p-930p NEW! Class Description: Looking for a fun and rewarding introductory wood turning experience? Turning wooden pens is a great way to learn about the beautiful and exciting world of wood turning with no prior experience needed. You’ll see your project take shape in just minutes and by the end of the class you’ll have beautiful pens that are ready to use. 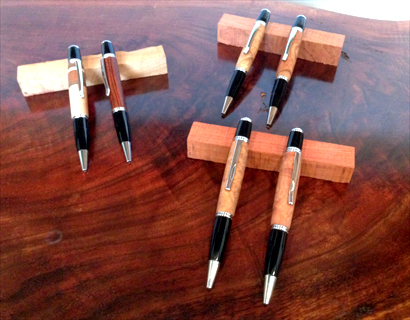 Pens make wonderful presents and are great projects to do with friends and family if you have a lathe at home. In the intimate setting of a small class, you’ll get plenty of individual attention. Your enrollment covers the first pen you make, but while in class, you can purchase an additional materials kit and make a second pen! Want to have your own private pen turning party? Just call us and we’ll arrange one for you. Perfect for bachelor or bachelorette parties, family gatherings or just getting some friends together! Tuition: $99 + materials ($29) – includes 2 pens, normally $19 each! 30% OFF Saves $30! Tuition is Only $69. No Coupon Code Required. Enroll Online, Call Us at (267) 331-5880 or Email Us! Private Parties: Call us (267-331-5880) or email us if interested in a private pen turning event or party – perfect for groups of up to eight participants!